On October 20, 2010 Phish played their first ever show in Utica in the heart of the Mohawk Valley. Utica Memorial Auditorium is a hockey arena with a capacity of about 5,500 and a design very similar to another round room and favorite Empire State Phish venue, Madison Square Garden. Utica was the smallest venue on Phish's fall tour and the atmosphere was charged with electricity. One clever fan even went so far as to craft a "Guyutica" sign that no doubt helped shape the night’s events. A new camera mounted at the front-of-house position accentuated the light show in a way never before featured on a live, indoor Phish DVD. The box set presents three hours of Phish in an intimate venue with an inspired audience that returned the energy at every turn. 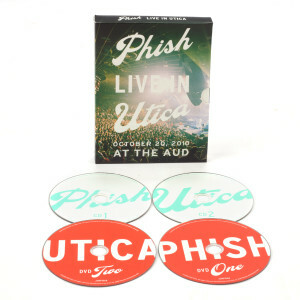 The Utica box set features the complete October 20, 2010 performance on 2-DVDs and 2-CDs. The nearly three hours of music on the Utica box set was recorded with 64 channels of digital multi-track and mixed and mastered, appearing on the DVD's in 5.1 Dolby surround and full-resolution, uncompressed PCM stereo. The video was shot with 8 cameras (16:9 widescreen), recorded and post-edited in High Definition. Regions 1-6. If you're here, you know about this show. The way the band integrated the Guyute theme throughout the show was a real game changer at the time, showing that not only were they excited to be playing again, they were intent on being Phishy again. The first set remains one of the very best of the modern era. However, the fact that the CD's in this set don't contain the complete show is a puzzler. Since the entire show can't fit on two CD's, perhaps an audio download code for the show should have been included instead. CD's are practically obsolete anyway, and editing/omitting songs for packaging's sake is pretty weak. Still, this is an excellent show and the DVD's are absolutely worth watching.